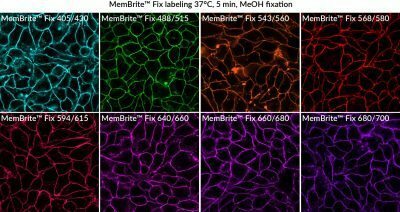 MemBrite™ Fix Cell Surface Staining Kits are designed for covalently staining the surface of live cells to conveniently visualize cell boundaries in immunofluorescence experiments. MemBrite™ Fix are new covalent cell surface stains that react irreversibly with cell surface proteins for staining that can withstand formaldehyde or alcohol fixation, and detergent permeabilization. Unlike lectins such as WGA, which bind specific targets that may vary between cell types, MemBrite™ Fix dyes react widely with cell surface proteins. MemBrite™ Fix staining is rapid and non-toxic to cells, and because MemBrite™ Fix dyes are highly water soluble, they stain cells much more evenly than traditional lipophilic membrane dyes like DiO, DiI, PKH, Vybrant®, or CellMask™. MemBrite™ Fix staining kits also can be used to stain yeast and gram-positive bacteria, but not gram-negative bacteria. See our Cellular Stains Table for more information on how our dyes stain various organisms. MemBrite™ Fix Staining Kits belong to Biotium’s line of novel cell surface stains that include CellBrite™ Fix Membrane Stains. CellBrite™ Fix Membrane Stains are fluorogenic dyes that rapidly accumulate in the plasma membrane, where they react covalently with the cell surface. CellBrite™ Fix stains require only a single staining step compared to MemBrite™ Fix staining, which is a two-step protocol. On the other hand, MemBrite™ Fix dyes are available with a wider selection of colors. MemBrite™ dyes do not associate with lipids in membranes, and consequently have lower cytoplasmic background after detergent permeabilization compared to CellBrite™ Fix. 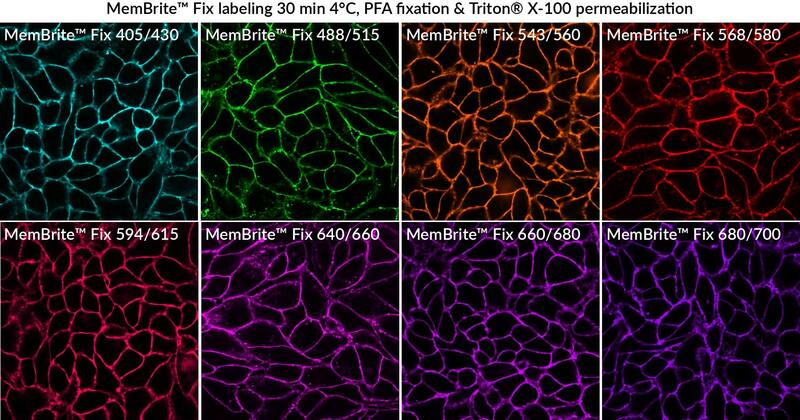 Several MemBrite™ Fix dyes have been validated in super-resolution imaging applications or 2-photon microscopy. MemBrite™ Fix-ST dyes are recommended for super-resolution imaging by STORM. 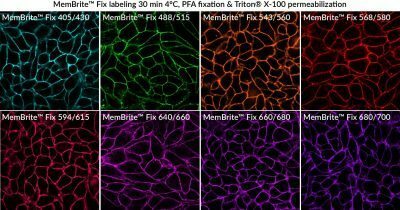 MemBrite™ Fix or MemBrite™ Fix-ST dyes can be used for standard microscopy applications; however, MemBrite™ Fix dyes are generally more photostable than MemBrite™ Fix-ST dyes. See the MemBrite™ Fix Product Table below for details. Note that MemBrite™ Fix dye stain dead cell more intensely than live cells. With prolonged dye incubation, or if cells are cultured after staining, the dye also will be internalized by endocytosis, resulting in labeling of intracellular vesicles. 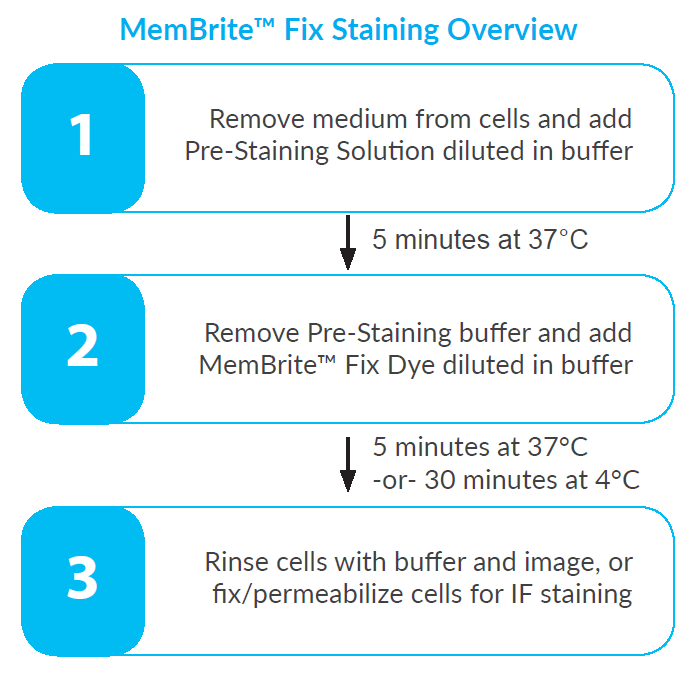 Please see our Tech Tip: Five Steps for Success with Membrane and Surface Stains for tips on staining and imaging (step 5) with MemBrite™ Fix. 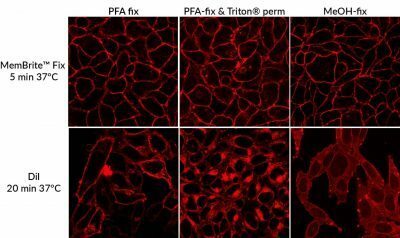 MemBrite™ Fix dyes must be used to stain live cells before fixation. They cannot be used to stain cells that are already fixed (the dyes primarily label intracellular membranes in fixed cells). Our original CellBrite™ Cytoplasmic Membrane Dyes can be used to stain cells after fixation. To find the right stain for your application, see our Membrane & Cell Surface Stains Comparison, or download our Membrane & Surface Stains Brochure. Note that MemBrite™ Fix dyes stain dead cell more intensely than live cells. 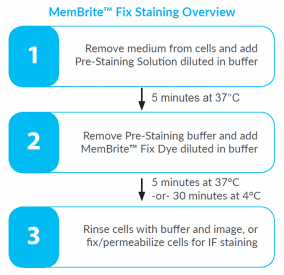 Please see our Tech Tip: Five Steps for Success with Membrane and Surface Stains for tips on staining and imaging (step 5) with MemBrite™ Fix. MemBrite™ Fix dyes are designed to be fixed shortly after staining. With prolonged dye incubation, or if cells are cultured after staining, the dyes will be internalized by endocytosis, resulting in labeling of intracellular vesicles. By 24 hours after staining, most of the dye will be localized inside the cell, not on the cell surface. For long-term visualization of cell morphology in culture, our stable, non-toxic ViaFluor® SE Cell Proliferation Kits may be a more suitable alternative. ViaFluor® SE dyes covalently label cells throughout the cytoplasm and can be tracked for several days or longer by microscopy or flow cytometry. See our Tech Tip: Using ViaFluor® SE Stains for Cell Tracing and Co-Culture to learn more. 1. Kit size based on 200 uL reaction volume, actual number of reactions depends on sample size. 2. 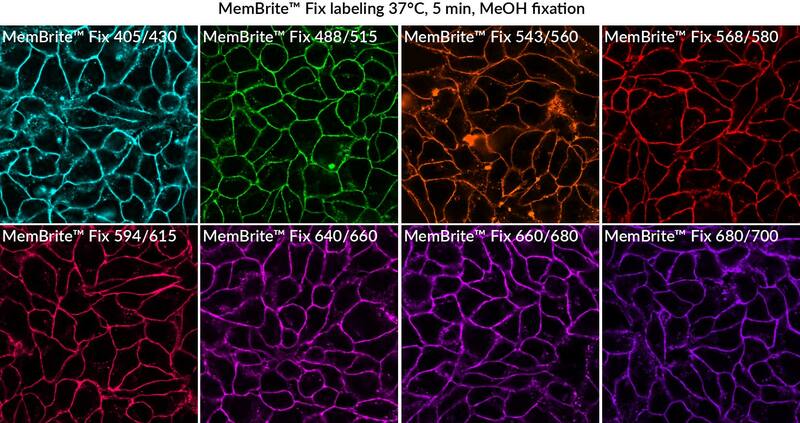 MemBrite™ Fix dyes are named for their Abs/Em maxima. Download the product information sheet for spectra. 3. MemBrite™ Fix-ST 681/698 dye is reported to have better performance in STORM imaging than MemBrite™ Fix 680/700 dye. Alexa Fluor & Texas Red are registered trademarks of Thermo Fisher Scientific; Cy Dye is a registered trademark of GE Healthcare; IRDye is a registered trademark of LI-COR Bioscience. Vybrant is a registered trademark and CellMask is a trademark of Thermo Fisher Scientific. 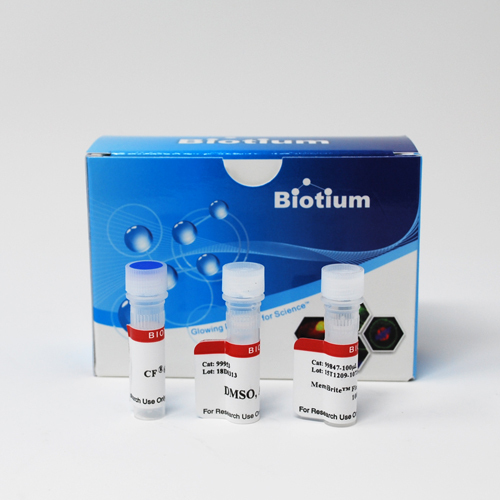 This product is wheat germ agglutinin (WGA) labeled with Biotium's CF® Dyes or HRP. WGA is a carbohydrate-binding lectin that has high affinity for sialic acid and N-acetylglucosamine.